Heads Arena Euro Soccer. Compete against big-headed soccer champions! This sports game lets you play in 1-on-1 and 2-vs-2 matches and tournaments. There are a dozen European teams with two star players. In Party mode, you can join a friend or play against each other. 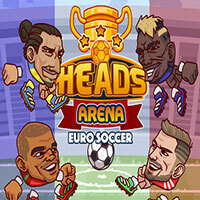 Try to outscore every team in Heads Arena: Euro Soccer! Play the”Will Grigg Mode” game mode and hear the soccer fans sing the “Will Grigg’s on fire” viral chant everytime you score as Will Grigg against Bastian Schweinsteiger in the match between Northern Ireland against Germany! This game can be played on all devices. Heads Arena Euro Soccer is a free online sports game on Round Games.